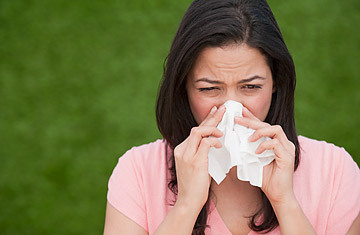 Allergy sufferers like to claim  in between sniffles  that each spring's allergy season is worse than the last. But this year, they might actually be right. Thanks to an unusually cold and snowy winter, followed by an early and warm spring, pollen counts are through the roof in much of the U.S., especially in the Southeast, which is already home to some of the most allergenic cities in the country. A pollen count  the number of grains of pollen in a cubic meter of air  of 120 is considered high, but in Atlanta last week the number hit 5,733, the second highest level ever recorded in the city. The bad news is that in a warmer world, allergies are likely to get worse  and that's going to cost sufferers and the rest of us. A new report released on Wednesday by the National Wildlife Federation (NWF) found that global warming will likely increase pollen counts in the heavily populated eastern section of the country and that the effect of climate change could push the economic cost of allergies and asthma well above the current $32 billion price tag. "The latest climate science makes it clear that allergies could get much worse," says Amanda Staudt, a climate scientist at NWF and the author of the report. "I really think this should be a wake-up call." Here's how it works: higher concentrations of CO2 in the atmosphere generally speed plant growth, while warmer temperatures mean that spring  and with it, allergy season  arrives earlier. Spring-like conditions in the East are already arriving on average 14 days earlier than just 20 years ago. Pollen from ragweed, which triggers most cases of spring hay fever, is projected to increase up to 100% between now and 2085 if fossil-fuel emissions continue to rise unabated. And more CO2 could make the ragweed pollen that exists more potent: if CO2 concentrations rise from current levels (385 parts per million) to 600 parts p.p.m., which could happen as soon as mid-century, ragweed pollen could become up to 70% more allergenic. An earlier, longer spring will just give ragweed more time to grow and give off pollen. As the climate warms, it is likely to favor trees that give off pollen  like oaks and hickories  over pines, spruces and fir trees, which don't. By 2100, once relatively cool states in the Northeast  including Vermont, New Hampshire and New York  could have the sort of highly allergenic trees now seen in the hotter Southeast, as species migrate north to adjust to the heat. Asthmatics will suffer as well  about 10 million Americans have allergic asthma, which is triggered by allergens. The condition tends to make people unusually sensitive to air pollution, and some studies indicate that pollution will worsen over time if fossil-fuel emissions aren't curbed. Ground-level ozone pollution from auto emissions, for instance, can trigger allergic asthma attacks, and it's likely to get worse as temperatures warm. One study found that climate change could increase the daily maximum concentration of ozone from 3 parts per billion to 5 parts per billion by 2050 in the Midwest and Northeast. During bad heat waves  which will also become more frequent on a hotter planet  those levels can double. "We've already seen an overall doubling of asthma in the U.S. since 1980," says Paul Epstein of Harvard's Center for Global Health and the Environment. "We can't afford it to get worse." There are ways to fight rising allergies even in a warmer world: for example, by replacing trees that emit high levels of pollen in densely populated areas  like the Norway maples found on New York City streets  with species that produce less, like mountain ash or golden rain. "We can get better allergy management and help people reduce their exposure to triggers," says Mike Triangle of the Asthma and Allergy Foundation of America. But absent a concerted effort to reduce carbon emissions, get ready for a sniffly future.